Beth and Diesel, Kathy and Elle, Sue and Lily, Melanie and Zorro, and me with Carlee on my knee. 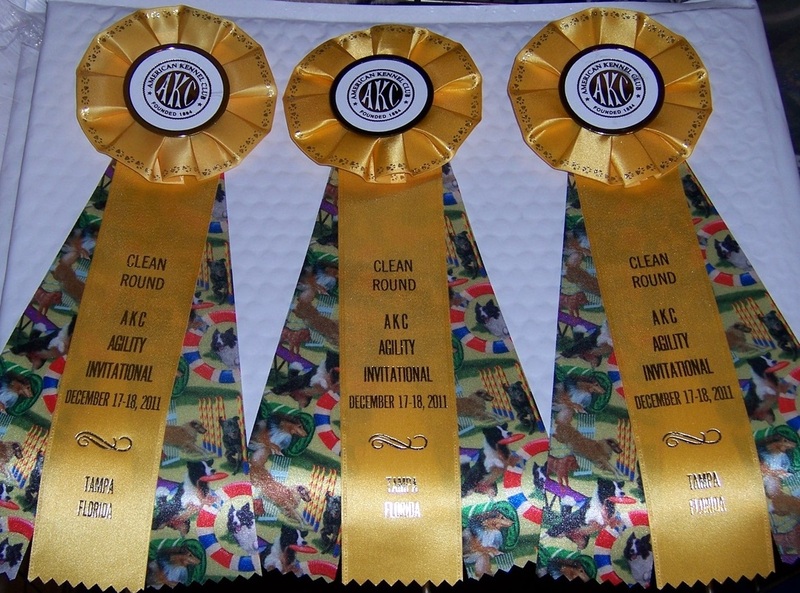 Carlee and I attended the 2011 AKC Agility Invitational in Orlando, FL, in December, and we had a hugely successful weekend! She had three clean runs out of four, and her one 5-point fault was totally my fault. She finished 36th overall out of the best 8" dogs in the country. I'm so proud of my little girl! Last year, Carlee was invited to the 2010 AKC Agility Invitational in Long Beach, CA, as the #3 Manchester Terrier, AND we qualified for the 2011 AKC National Agility Championship, held April 1-3, 2011, in Lexington, VA. Due to my back and neck injuries, we were unable to attend either event. In 2009, Carlee was invited to the AKC Agility Invitational in Long Beach, CA, despite missing over half the qualifying period due to my surgeries. We went, and it was a huge disappointment (not her fault). This YouTube video sums it up very well. 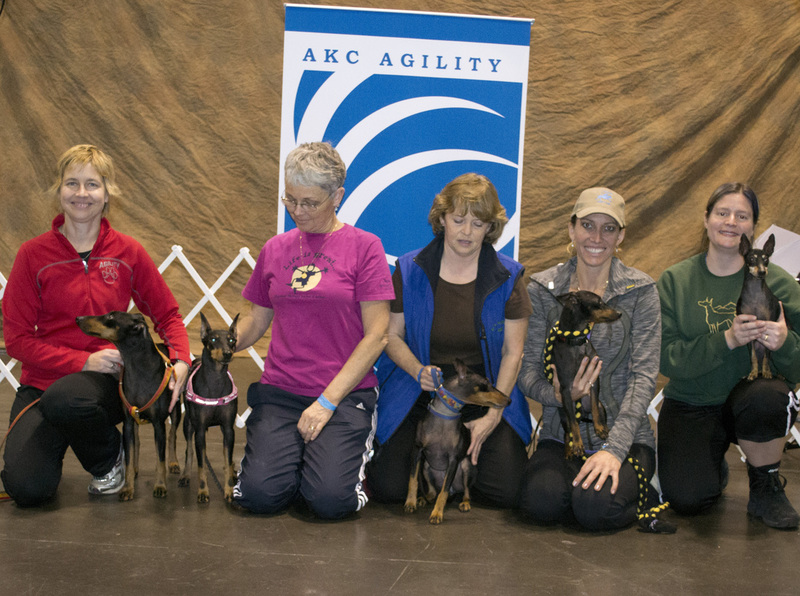 Carlee loved agility - she finished her MACH in June 2010, becoming the 9th MACH Manchester Terrier, and was working on her MACH2 - she just needed one QQ and 129 points when her untimely death prevented us from finishing this title. She was also working on her T2B title, and had two Triple Qs towards her TQX. Carlee qualified in her first four AKC trials to earn her NA and NAJ with all first place ribbons. She also earned her OA with two firsts and one second place, her OAJ with one first, one second, and one third place, her AX with two firsts and a second, and her AXJ with one first and two seconds. Carlee was the #3 Toy Manchester Terrier in AKC Agility Excellent B Standard and JWW rankings for all of 2006, and #2 in 2007. She was invited to and competed in the 2007 AKC Agility Invitational in Long Beach, CA. She was also invited to the 2008 AKC Agility Invitational, but we were unable to attend. In NADAC, she had one O-EAC leg, one OJC leg, one TG-O leg, one NCC leg, and one TN-O leg in addition to her Elite Agility (EAC), Novice Jumpers (NJC), Open Weavers (WV-O), Novice Touch & Go (TG-N), and Novice Tunnelers (TN-N) titles. In ASCA, Carlee had her Regular Standard Elite (RS-E), Jumpers Standard Elite (JS-E), and Gamblers Standard Open (GS-O) titles, plus assorted Regular and Jumpers points towards her ATCH. In UKC, Carlee earned her UAG1 title with four qualifying scores, including two 200 scores, in her first four trials. Carlee earned her first CD leg with a 183 1/2 and third place from the Novice B class at the Nita Nee Kennel Club Obedience Trial on 7/18/08. She finished her CD title with two qualifying scores at the Steel Valley Cluster on 7/31 and 8/1/08. Carlee was the #2 Toy Manchester Terrier (First & Foremost system) in AKC Novice Obedience for 2008, published by Front & Finish Magazine. Carlee finished her United Kennel Club CD (UCD) with a score of 188 for her third leg at the Four Star Belgian Shepherd All-Breed Obedience Trials on August 12, 2008. She earned her first two legs towards her UCD with scores of 189 1/2 (4th place) and 180 at the Obedience Training Class of Harrisburg's UKC Obedience Trials March 1-2, 2008. Carlee earned her RN title with scores of 97 (2nd place), 96 (3rd place), and 88 (my handler error cost her 10 points and 1st place!). She earned her RA with scores of 95 (1st place), 89 (3rd place), 85 (3rd place), and 96 (2nd place). And she earned her RE with a 92 (1st place), an 81 (3rd place), and a 94 (2nd place). She was the #1 Toy Manchester Terrier in AKC Rally Excellent A, and the #2 Toy Manchester Terrier in the overall Rally Excellent rankings for 2007. Carlee earned her first RAE leg at the Delaware County Kennel Club trial on 3/14/09 with a 94 (Excellent B) and 91 (Advanced B). She earned her second and third RAE legs at the Baytown Kennel Club and Beaumont Kennel Club shows on 4/25 and 4/26/09. At the Cocker Spaniel Club of Western PA All-Breed Obedience and Rally Trials on 6/26/09, she earned her fourth RAE leg with an 83 in Excellent B (3rd place) and a 92 in Advanced B. Carlee earned her fifth RAE leg at the Putnam Kennel Club trial on 7/17/09 with a 96 (2nd place) in Advanced B and a 93 (3rd place) in Excellent B. The following day, she earned her sixth leg with a 95 (2nd place) in Advanced B and an 86 (3rd place) in Excellent B, and was High Scoring Manchester Terrier in both classes. Carlee earned her seventh and eighth RAE legs with scores in the 90s and two placements (2nd and 4th) at the Dog Hair 'N Eggnog Cluster in Long Beach, CA, in mid-December, and her ninth leg at the Non-Sporting Group of the Garden State All-Breed Rally Trial on 3/25/10. Carlee finished her RAE in style at the Westmoreland County Obedience Training Club trial on 6/12/10 with two scores of 96 and two second placements! Carlee earned her Canine Good Citizen (CGC) Certificate at the Antelope Valley Kennel Club Match on 9/11/05, and her TT (American Temperament Test Society) at the Golden Triangle Irish Setter Club test on 4/28/07.